Chaos: While this card is flipped, it has +1 power for each card in your hand. At the start of a Problem faceoff involving this card, draw a card. 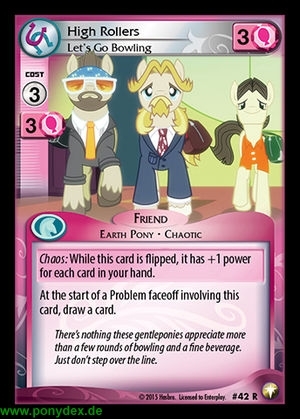 "There's nothing these gentleponies appreciate more than a few rounds of bowling and a fine beverage. Just don't step over the line."